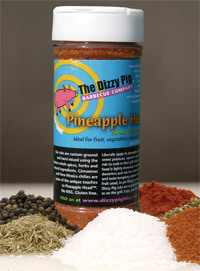 The Dizzy Pig Barbecue Company produces eleven different all natural spice blends. Of the lot, Pineapple Head may be the most unique. While most BBQ companies focus solely on seasoning meat, The Dizzy Pig created a sweet spice blend designed specifically for grilled fruit and desserts. Dizzy Pig actually recommends Pineapple head for a variety of sweet and savory dishes. Customers have used it on everything from porkchops to icecream. I decided to use my sample of Pineapple Head for its original purpose. I sliced a whole pineapple and applied a generous amount of seasoning to both sides of each slice. I grilled the pineapple for a few minutes on each side over medium-high heat. This was my first time grilling pineapple (or any fruit). Grilling the pineapple definitely took a lot of the citrus tang out of the fruit. Though the sweetness was enhanced, the overall flavor was much more mild than fresh pineapple. Pineapple Head's cinnamon and sugar blend created a flavor profile similar to apple pie. I should have added a scoop of ice cream to the fruit. The sweet and earthy spices turned the tropical fruit into comfort food. After using Pineapple Head, I can see it being good for many diverse applications. It's great for grilled fruit, but could be used to on cakes, pies and cookies as well. Were I to purchase Pineapple Head, I think I would also like to try it out on sweet potatoes. Though I'd have to test it to truly recommend it on meat, I could see Pineapple head providing a pleasant sweetness to pork chops, ham or chicken. To learn more about Pineapple Head and other Dizzy Pig Barbecue products, click the title of this review. See how Pineapple Head compares to other spice rubs on our "Product Reviews" page. 0 Response to "Dizzy Pig Pineapple Head"